The volume analyses the complex historical and political context for the processes of state formation in independent India. It provides both a conceptual and empirical framework for an understanding of Indian democracy through the perspective of reorganisation of states. Following the recommendations of the States Reorganisation Commission (SRC) in 1956, the territorial boundaries of the states were redrawn. However, within a decade, the geo-linguistic and cultural-ideological criteria could not be considered satisfactory for the future division of states. 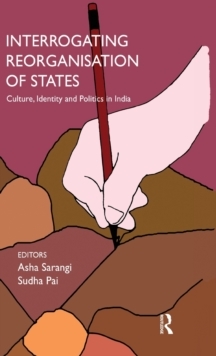 With the formation of three new states (Chhattisgarh, Uttarakhand and Jharkhand) and the demand for Telangana statehood not accepted as yet, new dimensions and perspectives about state formation as a critical political practice have surfaced yet again in contemporary India. The book addresses a number of significant themes related to states reorganisation and its effects - questions of underdevelopment, size, political participation, governance, cultural identities - and also analyses the demand for smaller states. It focuses on different states, their historical and contemporary trajectory leading to the demand for territorial remapping and thus recognising specific political and cultural resources, and identities in the regions and sub-regions of states in India. The book will be useful for those studying politics, history, sociology, comparative politics and South Asian Studies.